I'm attempting to have more of a dairy free lifestyle again after months of indulging in chocolate and cheese. My main boost to do this was when I noticed that Tesco had started doing dairy free ready meals. Yes they are now a thing and I could not be happier. Mainly because if your lactose intolerant it is very hard to get ready made food that doesn't contain milk. All prayers have been answered here! 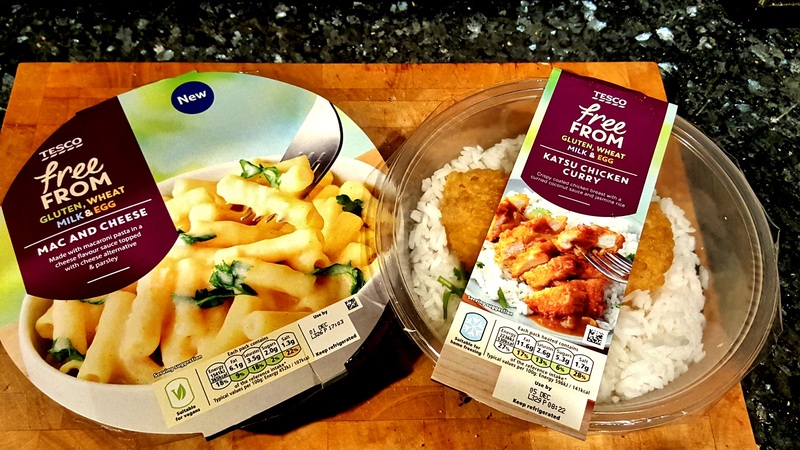 I picked up one of the mac and cheese ready meals and one of the chicken katsu curry ready meals. Honest opinion the mac and cheese was not that great but that in my opinion was mainly due to the gluten free pasta - have to say I am not a fan. Also the no-cheese cheese sauce seemed to have a spicy kick to it. That one was not for me. The katsu chicken curry however was lovely you couldn't even tell the difference. (Though I do think katsu curry generally is milk free). This one was lovely however and I would recommend it. These are just two out of the range, they had a few other meals such as chicken tikka masala and chicken and bacon pasta. Only issue being these would not be helpful if you're a vegetarian as the majority of the meals contained meat. Although with how much Tesco have expanded their Free From range recently I'd be willing to bet they would add more and more meals to the range. All in all I'm definitely a fan of these ready meals and they make life alot easier when you are not in the mood to cook. I can't wait to see what other products are added to the range over time. Thank you Tesco for making trying to be dairy free again a little bit easier.